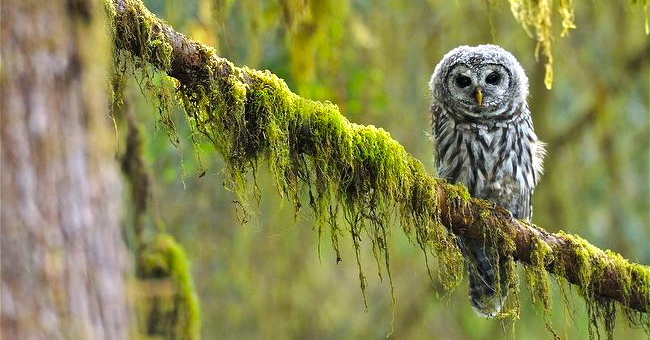 Above: a barred owlet on a moss-covered branch. With the current trends in habit degradation and climate change, monitoring the world’s biodiversity is becoming increasingly important worldwide. Ecological monitoring facilitates tractable policies, and is inevitably welcoming to improvements in field methods. More accurate, time-efficient and cost-effective surveying techniques have strong potential to fortify conservation efforts, and fieldwork in general. Traditional techniques for surveying birds include: mist netting, point-counts, transects, and direct observation; however audio recording methods have been increasing in popularity (Rempel et al. 2005, Acevedo and Villanueva-Rivera 2006, Campbell and Francis 2011, Venier et al. 2012). A screenshot of a barred owl spectrogram. The yellow syllables comprise the vocalization (this is the “who-cooks-for-who” call). 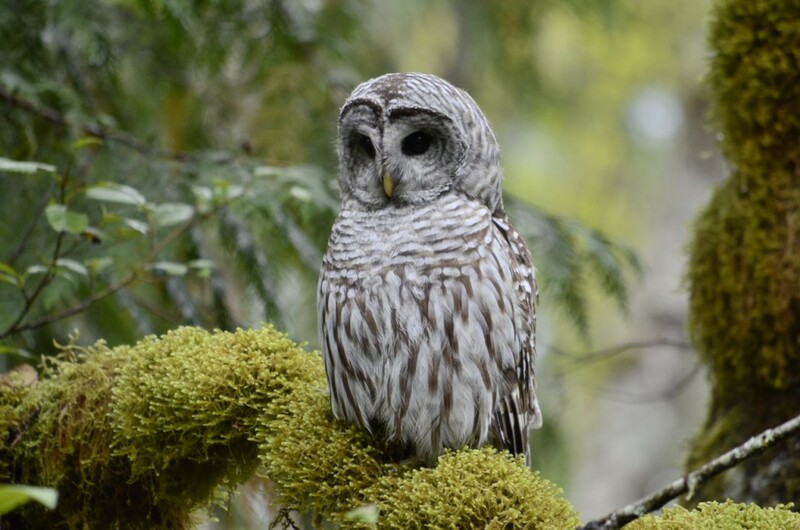 This summer I will be expanding my previous research involving automated species detection of barred owls (Strix varia). Automated species detection is the use of computer software to identify bioacoustic patterns in an animal’s (recorded) vocalization(s). My summer research project involves designing automated recognizers for barred owls using vocalizations at known distances (10m, 25m, 50m, 100m, 150m, 200m, 250m, 300m, 400m, 500m, and 600m). Data sets and were generated using stereo systems to playback data, at known distances, with multiple replications. The generated recognizers will then be applied to real field data, and their efficacies will be assessed. 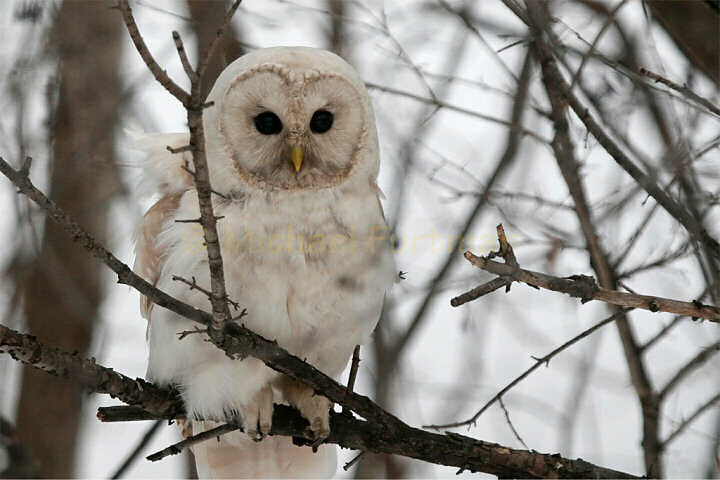 The low frequency of barred owl vocalizations can be problematic due to disruptive interference with background noise. However, the background filters provided in most automated species recognizer software help to mitigate this bioacoustic corruption, and with minor to no impacts on the data itself. Audio recording methods are advantageous for many reasons. These can include the simplicity of set-up, the quantity of data that can be obtained, and the capacity for repeating and reviewing recordings (Rempel et al. 2005, 2013). In addition, the recording software allows for cost-effective replicate recordings, thereby increasing the probability of detecting species (Rempel et. al 2013). After collecting audio recordings, data can be analyzed manually through directly listening to the audio data, or through the use of automated species recognizers that use computers to identify bioacoustic patterns. Recent research has been working to understand how computers can be used to optimize detection for different types of species (Chesmore and Ohya 2004, Rempel et al. 2005, Waddle et al. 2009, Venier et al. 2012). 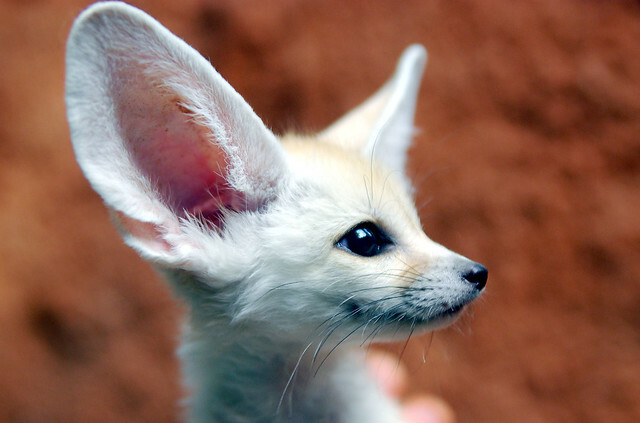 In general, having a person listen to recordings is efficient for species that vocalize regularly, but this method seems to be less effective for rare and uncommon species that call relatively infrequently (Rempel et al. 2005). Automated species recognizers solve this problem by rapidly scanning for species via continuous and unattended data analyses. However, numerous challenges remain with automated recognizers because of regional variation in bird calls, the type of recognizer used, issues with false positive and false negative identification, and the type of recording done. A specific issue that has not been well addressed in the literature is how accurately automatic recognizers detect animals that are located at considerable distances from the recorder. Recent publications have utilized automated species recognition to analyze bioacoustic data for amphibians, bats, grasshoppers, passerines and other bird species (Kogan and Margoliash 1998, Chesmore and Ohya 2004, Swiston and Mennill 2009, Waddle et al. 2009). Above: a mature barred owl on another mossy perch. The sunken-in facial discs are reasonably prominent in this photo, and they help to augment hearing and integrate directionality into incoming sounds! Acevedo, M. and Villanueva-Rivera, L. 2006. Using Automated Digital Recording Systems as Effective Tools for the Monitoring of Birds and Amphibians. Wildlife Society Bulletin 34: 211-214. Campbell, M. and Francis, C. 2011. Using stereomicrophones to evaluate observer variation in North American breeding bird survey point counts. The Auk 128: 303–312. Chesmore, E. and Ohya, E. 2004. Automated identification of field-recorded songs of four British grasshoppers using bioacoustic signal recognition. Bulletin of Entomological Research 94: 319-330. Kogan, J. and Margoliash, D. 1998. Automated recognition of bird song elements from continuous recordings using dynamic time warping and hidden Markov models: A comparative study. Journal of the Acoustical Society of America 103: 2185-2196. Rempel, R., Hobson, K., Holborn, G., vanWilgenburg, S. and Elliot, J. 2005. Bioacoustic Monitoring of Forest Songbirds: Interpreter Variability and Effects of Configuration and Digital Processing Methods in the Laboratory. Journal of Field Ornithology 76: 1-11. Rempel, R., Francis, C., Robinson, J. and Campbell, M. 2013. Comparison of audio recording system performance for detecting and monitoring songbirds. Journal of Field Ornithology 84: 86-97. Swiston, K. and Mennill, D. 2009. Comparison of manual and automated methods for identifying target sounds in audio recordings of Pileated, Palebilled, and putative Ivory-billed woodpeckers. Journal of Field Ornithology 80: 42–50. Venier, L., Holmes, S., Holborn, G., McIlwrick, K. and Brown G. 2012. Evaluation of an Automated Recording Device for Monitoring Forest Birds. Wildlife Society Bulletin 36: 30-39. Waddle, J., Thigpen, T. and Glorioso, B. 2009. Efficacy of automatic vocalization recognition software for anuran monitoring. Herpetological Conservation and Biology 4: 384-388.